Boeing 707-379C 5X-JEF (c/n 19821/718) is seen here (un)loading cargo at Manston-Kent Int'l Airport on 25Aug2000. Das Air Cargo was founded in 1983 and operated between Africa and Europe. 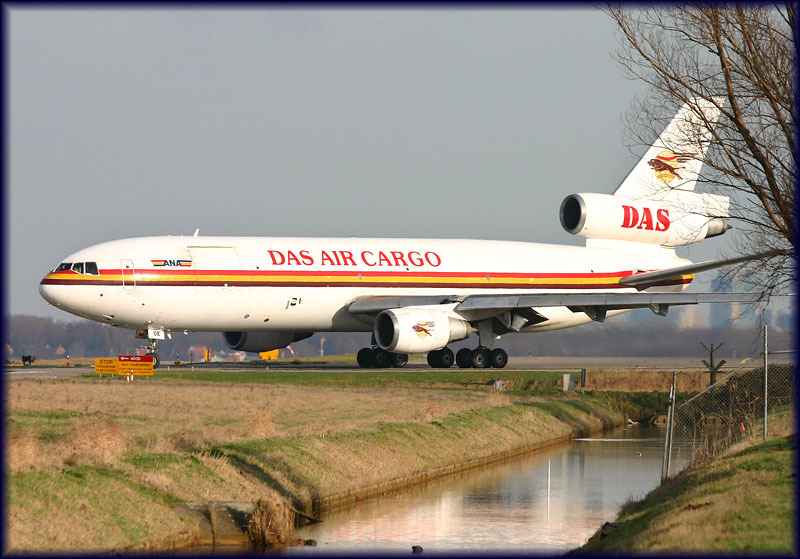 DAS is an abbreviation for: Dairo Air Service, but Das Air Cargo was the name it traded under. The company kept flying the DC-10s, while other company's changed to other equipment for reasons of the fuel bills, noise abatement restrictions, rising costs of maintenance, etc. McDonnell-Douglas DC-10-30(F) 5X-JOE (c/n 47906/115) exits S-ramp at Amsterdam on 18Jan04. Das Air and Northwest Airlines were the last frequent visitors to Amsterdam operating DC-10 equipment. "DAS Air Cargo, a Ugandan carrier with operations across Europe for over 20 years, has been forced to close its operations after failing to recover from a ban by the European Union (EU), imposed on its aircraft, last year. The airline has also been forced into administration and a UK management firm, Menzies Corporate Restructuring (MRC), appointed its joint adminsitrators. "We are out of business, the offices have closed and the boss (Capt. Joe Roy ) is out in the DR Congo , pursuing some other private business," a DAS official told East African Business Week on condition of annonymity, last week. "We have been spending high for long and it's been quiet a challenge," the source added. The airline tried to return to business eight months ago after being struck off the list of airlines that were last year banned from operating in EU skies but appears to have been overwhelmed. This followed a suit by DAS Air, challenging the sudden ban for operating a fleet of DC-10 aircraft within the EU. DAS Air won the suit. High fuel costs, administrative spending and costs of the suit to fight the ban have since been some of the factors blamed for the airline's downfall. The source said the airlines customer base begun to drop while its financial performance has since declined drastically. One of the administrators, Mr. Andrew Duncan, told AirCargo News, a UK based online publication that DAS officials would have the opportunity "to come up with a restructuring proposal or to sell the business as a going concern, thereby saving jobs and minimising disruption to its customers." "DAS struggled on after the ban, but it was unfortunately that which brought it to the situation it now finds itself in," he added. Its fleet of two has since been grounded at London's Gatwick Airport but other sources said they had been moved to Manston, Kent International Airport. Last year, Das Air officials told this reporter they suffered a US$2.5million loss every week due as a result of the ban. Prior to its ban, DAS Air was doing brisk business, mainly transporting horticultural products (fresh fruits and flowers) from East Africa to Europe. About 90 airlines, mainly from Africa, Eastern Europe and Asia were blacklisted from EU skies last year following a series of crashes worldwide, blamed on poor maintenance and reluctance to observe strict safety regulations. However, many of these have been withdrawn from the list after they ceased operations, mainly after they failed to secure renewal of respective operating licenses. New companies created mainly from the same countries facing the ban were added to the list for a total ban. At its peak in 2006, the company enjoyed annual revenues in excess of US$200 million. In 2003, the airline won two prestigious awards, the Best Cargo Airline to Africa and Best All Freighter Carrier, 2003." When DAS Air Cargo ceased its operations in 2007, it had 2 aircraft still to its name, both DC-10s: 5X-JOE and N65SS (c/n 46541). In 2005 the fleet included DC-10s: 5X-JOE, 5X-BON (c/n 46921), 5X-JCR (c/n 47831, 5X-JOS (c/n 46976) and N401JR (c/n 46590). How quickly decline can set in. At the time of writing efforts are in place to restart the company with other equipment, perhaps under a different name. "21 November 2007, London: Andrew Duncan and Andrew Stoneman, partners and Joint Administrators from Menzies Corporate Restructuring (MCR), announce today the sale of the business and assets of DAS Air to Continental Aviation Services (Nig) Limited (CAS). The liabilities of the Company remain with DAS Air Limited (In Administration). The Company, a long established UK based air freight services business operating routes between Europe and West Africa and between East Africa and the Middle East had ceased operations following the appointment of administrators on 17 September 2007. The sale of the business should allow operations to recommence in the short term and preserves the jobs of 34 staff, who work at the Company’s sites in Crawley and Manston. Andrew Duncan comments, "We’re pleased that the sale of the business represents the preservation of a long established African all cargo airline. It’s also good to note that of all the offers we received for the business from interested parties, CAS had the best funding package to acquire the business but also to fund investment and its future working capital requirements. I believe that this gives the business a very real chance to thrive and succeed, going forward." Vitalis Ibe of CAS commented, "We are very excited with the opportunity to acquire this business and Charles Goodrich has been appointed as the CEO. We are looking forward to building a brand new vibrant cargo airline and maintenance facility".